Bus from Johor Bahru to Tanjong Malim is a typical long distance journey bus trip in Johor Bahru. With the strategic location of Johor Bahru by just a bridge away from Singapore, it becomes the second largest cities in Malaysia. The city attracts many people from around Malaysia to settle down their life in Johor Bahru, including those from Tanjong Malim. Many of them rely on bus service to travel from Johor Bahru to Tanjong Malim. Train from Johor Bahru to Tanjong Malim is available but it is not the preferred choice. That is because the portion between Johor Bahru to Gemas are still operating with old train which is moving very slow. After arrival at Gemas, transfer to ETS train is required. These hassle push people away from taking train from Johor Bahru to Tanjong Malim While flight service is not available for Johor Bahru to Tanjong Malim. 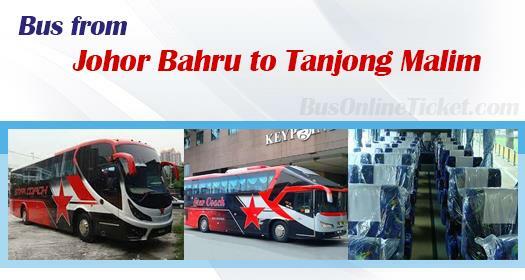 JB Transliner and Star Coach Express (managed by Sin Yong) are the only two operators providing bus from Johor Bahru to Tanjong Malim. The schedule for this bus service is very limited with only 3 daily departures. The bus fare for bus from Johor Bahru to Tanjong Malim is reasonably charged at a price of RM 65.00. The duration for bus to Tanjong Malim from Johor Bahru is approximately 6 hours, depending on the traffic and weather condition on your departure day. The departure points in Johor Bahru are at both Johor Jaya Bus Terminal and Tun Aminah Bus Terminal. Kindly note that the arrival point in Tanjong Malim is at the road side of Tanjong Malim town. BusOnlineTicket.com is a popular transport ticketing portal in Malaysia. You can buy bus ticket for bus from Johor Bahru to Tanjong Malim through BusOnlineTicket.com to avoid disappointment. Your booking in BusOnlineTicket.com is instantly confirmed upon payment. Hence, this reliable online booking service is convenient and hassle-free.